In the last installment of Your Brain on Banjo, we eradicated the myth that the ability to learn by ear is an inborn gift. Save those with true tone deafness, or congenital amusia, everyone possesses the requisite neurobiology to learn how to do it. For some of you, the next question may be: why should I? Before we go any further, let’s get this out of the way: This is not an anti-tablature article. Tab (or notation) is a wonderful tool, with many uses that are beyond the scope of this discussion. Learning to play by ear doesn’t mean you must swear off all written forms of music for the rest of your life – in fact, they can function as a helpful aid in the learning process. That said, depending on tab exclusively might hamper you in ways you may not fully appreciate. The obvious limitations of a tab-only approach are that you’ll remain dependent on written sources for learning new tunes, and on-the-fly improvisation is out. You play a tune flawlessly at home, but it falls apart when you attempt it in a jam. You’d like to add variations to the way you play a tune you’ve learned from tab, but find it nearly impossible to deviate from the arrangement you learned. You find it really hard to play through tunes without the tab in front of you. Likewise, committing a tune to memory is a difficult, painstaking process. What’s to blame for these roadblocks? Let’s take a look inside your noggin to find out. Want to find out if you have what it takes to learn to play by ear? Here’s a rough synopsis of what happens in the brain when you learn a tune entirely from tab. First, light reflecting off the page of tablature enters your eye and strikes the retina, stimulating photoreceptors there that transduce the electromagnetic energy into nerve impulses. Those impulses are then relayed on to visual cortex in the back of the brain where a rudimentary image is first decoded. Once this happens, the image data is then relayed to sophisticated association networks that extract meaning from it. After the tab symbols are deciphered, the information is then sent forth to motor planning areas in the front of the brain where a movement plan is rendered. To execute that plan, nerve impulses are delivered to primary motor cortex, down through the base of your brain and spinal cord, into peripheral motor nerves that trigger the coordinated firing of the muscles that control your fingers. If all goes well, the end result is an accurate sonic reproduction of the printed music. Through this process, the symbols on the page have been transformed into banjo music using your brain and body as the conduit. With practice, you might get quite good at this tab-reading procedure, eventually reaching a point where you can play through a tune as you read it. This occurs thanks to the creation of tight tab-specific mappings between visual and motor cortex (i.e “see this, do this” connections). Notice, however, that something is conspicuously absent from the aforementioned neural procedure for playing from tab: The Sound. 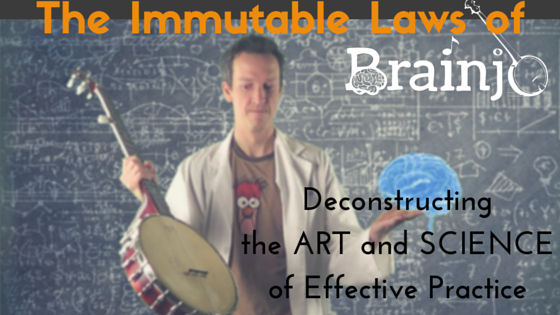 Though the outcome of this process was music from the banjo, our brain got us there without needing any sonic representation of the music whatsoever. Our auditory cortex – the part of our brain that deals in sound – played no part in the making of the music. A bit odd, right? Why is it difficult to play a tab-learned tune in a jam? Well, it goes without saying that when playing music with others, listening is essential. Odds are we can’t just plow through the tune exactly the way we play it at home with no regard for what the other musicians are doing. On the contrary, to fit in successfully with others our brain must adjust the motor output to our hands based on what we hear. Yet, if we’ve excluded the hearing parts of our brain when we built our banjo playing neural networks, then we lack the needed neural machinery to make those adjustments. This isn’t some deficiency of musical ability; it’s simply a natural neurobiological consequence of learning methodology. 1 – Memorize the entire tab visually. Save those with photographic memories, this is quite hard. 2 – Memorize the entire sequence of movements in the left and right hands. While easier than the first option, this is still a challenging task. Not to mention it’s no fun! Worse yet, these types of memories are both harder to form and more liable to degrade over time. So if the neural networks built from a tab-only approach are limiting, what kind of networks would serve our needs better? The ability to communicate with our voices is so important to our species that Mother Nature has fine-tuned the learning process for it over millions of years. As a result, virtually every baby human is born a master at language acquisition. Given the many parallels between language and music, childhood language acquisition provides us with an ideal model to emulate. Consider then how a little girl learns to reproduce the sounds of her native tongue. To begin, she listens intently to every word uttered by the people around her, slowly building a repository of sounds that are specific to her language. Then she begins to try to reproduce those sounds using the muscles that control the mouth, tongue, chest, and larynx (the vocal apparatus). These initial attempts at language are crude, but with practice become increasingly sophisticated. In just a few years, she’s mastered the sounds of her language. Through the aforementioned learning process, she has built an extensive library in her brain of correspondences between chunks of sound and movements of her vocal apparatus. These “sound-to-motor” mappings are so efficient that they are able to almost instantly translate her thoughts into speech. Furthermore, with these elements in place, learning how to say a new word is usually as simple as hearing it once. Not surprisingly, almost all players who have achieved banjo mastery have followed a nearly identical path. It’s a path that also begins with copious listening – this time to the sounds of the musical language he or she wishes to speak. Through this intent listening, a repository of genre-specific (e.g. bluegrass, old-time, punk, etc.) sounds is constructed. Initial attempts to reproduce these sounds on the banjo are rudimentary and uncoordinated, but with practice become increasingly sophisticated and efficient. Eventually, through this learning process, an extensive library of correspondences between chunks of sound (a.k.a. “licks”) and movements of the hands are formed in the brain. In the master banjoist, these sound-to-motor mappings are so efficient that he or she can almost instantly translate imagined banjo sounds into movements of the hands. With these maps firmly established, learning how to play a new tune (and memorizing it) is as simple as learning how the melody goes. The gift of neuroplasticity provides us the remarkable opportunity to customize our brains to serve our needs. Whether we end up building a brain that does so, however, depends entirely on how we practice. So if your goal is to maximize your brain’s banjo-picking potential, then building these sound-to-motor mappings in the brain is critical to doing so. To build them, though, You must use your ears. 1. Always, always, always know how a tune is supposed to sound before you start learning it from tab. Not only should you know the melody cold, but also knowing how the particular banjo arrangement should sound is ideal. 2. When learning a tune by tab, get the tab out of view as soon as possible. Get in the habit of using your ears, not your eyes, to tell you if you’re playing a tune right. 3. Start trying to pick out simple, well-known melodies by ear (only the basic melody, don’t add rolls initially). 4. Look up the chord progressions to some familiar songs. Then, practice strumming along to a recording, using your ear to tell you when you should change chords. Remember, virtually every one of you has a brain capable of playing music by ear, even if the prospect of it seems daunting. With a little patience and persistence, however, you may one day find yourself wondering how it ever seemed so.